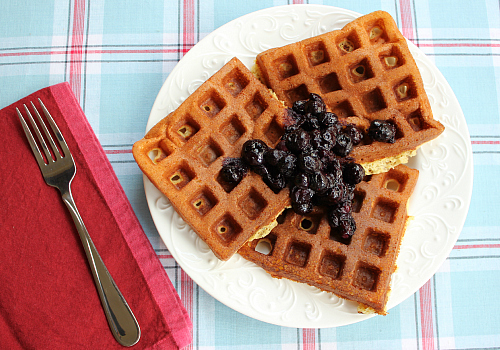 before we went on the garden tour on sunday, we made cornmeal waffles with blueberry compote for breakfast. what a wonderful way to start a sunday morning! these waffles were so light and delicate. 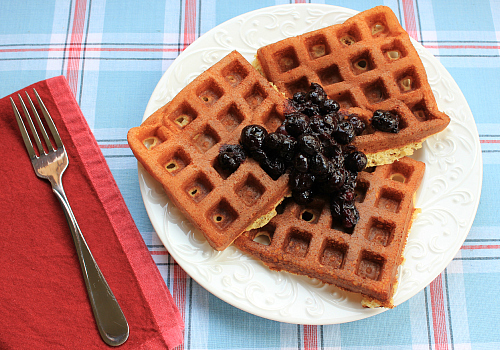 the cornmeal and the honey in the waffles gave them such a great flavor. 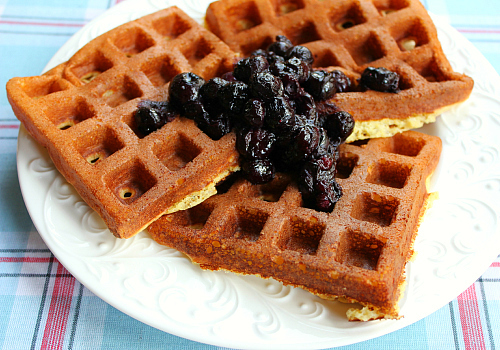 instead of serving them with maple syrup, we made a simple blueberry compote to put on top of the waffles. the combination of the cornmeal waffles with the blueberry compote was delicious. they tasted just like blueberry corn muffins. yum! this recipe made a lot of waffles for just two people, so we froze the extra waffles in a ziploc bag. it's so nice to open up your freezer and to find waffles in there. all you have to do is put them in the toaster to reheat them when you are ready to eat them again. to make the waffles, preheat your waffle iron according to the manufacturer's instructions. in a bowl, combine the flour, cornmeal, baking powder, and baking soda. in a separate bowl, whisk together the buttermilk, eggs, honey, and vanilla. add the wet ingredients to the dry ingredients and stir until combined. stir in the melted butter. pour enough batter into the waffle iron to just barely cover the waffle grid (usually about 1/2 cup of batter per waffle). cook for 4-5 minutes, or until the waffles are golden brown. once cooked, transfer the waffles to a baking sheet and keep them in a warm oven while you prepare the remaining waffles. serve hot with warm blueberry compote. to make the blueberry compote, place the frozen blueberries and the sugar in a saucepan. cook over medium-high heat, stirring occasionally, until the blueberries become soft and juicy (about 4-5 minutes). remove from the heat. They look very good. I bet the cornmeal gives the waffles a nice texture. Blueberries made a nice topping.